Mag-E is the ideal supplement for working and travelling horses to provide a well absorbed form of magnesium, as well as essential Vitamin E and Vitamin B1, to help nerve and muscle function. High levels of organic magnesium - with the majority provided by “organic” amino acid (yeast) chelate that reaches the absorption sites as an “amino acid shielded” complex for optimum absorption. Highly palatable, with vanilla flavouring, to tempt even the fussiest of eaters! 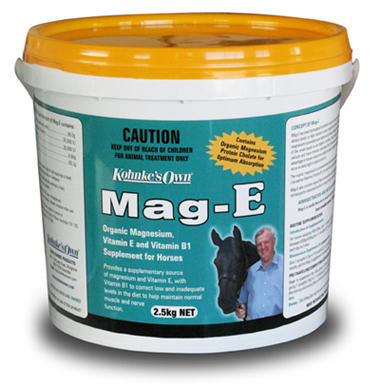 Mag-E with organic magnesium supplements low dietary uptake to help keep your horse unfazed by training, traveling and competition.